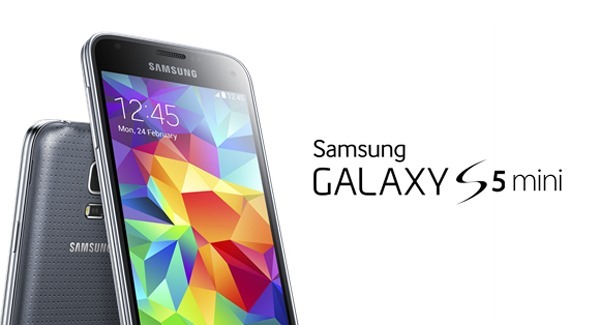 When Samsung announced and subsequently released the flagship Galaxy S5 earlier this year, we knew that it wouldn’t be the last in the series for 2014, and that the company’s marquee release would spawn a number of spin-offs. We’ve already been treated to the likes of the camera-centric Galaxy K, or Galaxy S5 Zoom, but the one we were really waiting for was the down-sized Galaxy S5 mini. Today, the Korean company has granted our wish, officially unveiling the device by means of a press release, and below, we’ve got all of the info. The world of smartphones is a specs-dominated business, and as such, we’ll dive straight into the internal hardware. 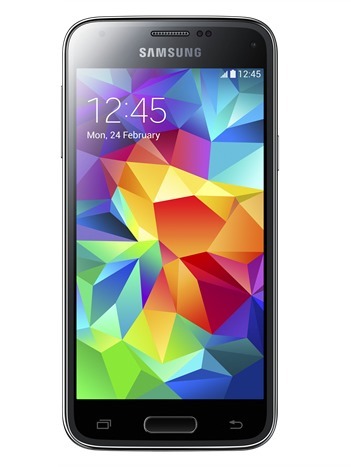 The Galaxy S5 mini boasts a quad-core SoC clocked at 1.4 GHz, allied to a reasonable 1.5GB of RAM, and although this isn’t anything to write home about by comparison to the main Galaxy S5, it’ll satisfy the requirements of the mid-range market. 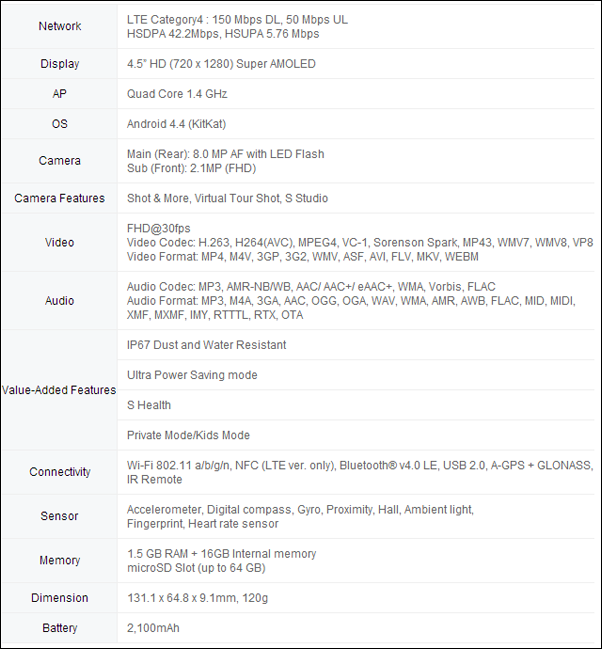 The device also packs a 4.5-inch HD Super AMOLED display with a resolution of 1280 x 720, and although, once again, this won’t dazzle nor yield the acclaim that the full-size Galaxy S5 has managed so far in its short lifespan, it’ll still present Android 4.4 KitKat in all of its glory. 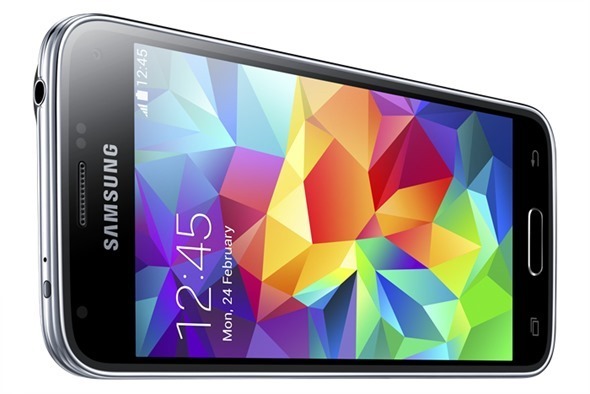 The Galaxy S5’s rear-facing camera, like its display, has also been heavily lauded by consumers and commentators alike, but while the mini’s 8-megapixel offering doesn’t come with perks like 4K video capture, it will still provide a decent enough point-and-shoot experience to ensure that you don’t miss that Kodak Moment. From the back, Samsung describes the device’s design as a “unique perforated pattern on the back cover creating a modern and sleek look, along with a premium, soft touch grip,” while the front profile also appears fairly similar to the Galaxy S5. Indeed, as well as bearing a striking resemblance to the April release, it also carries over several of its key features, notably IP67 certification, Ultra Power Saving Mode, heart rate sensor, and that fingerprint scanner. As for colors, you get “Charcoal” Black, “Shimmery” White, “Electric” Blue and “Copper” Gold, and as you’d expect, there’s also LTE connectivity. The device will launch over the next couple of weeks in Russia, with expansion farther afield set to follow thereafter. 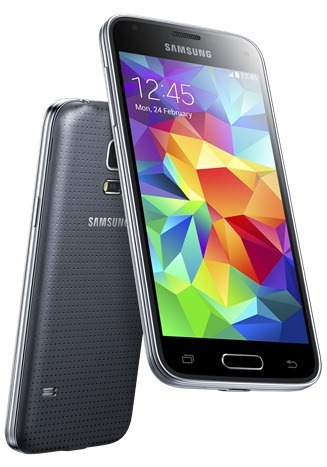 On first impression, what do you make of the Galaxy S5 mini?